We have marked a distinct and dynamic position in the market by providing a high quality array of Aquarium Blower . Color: Blue colour body, black handle and white colour net. EHEIM filter media highly efficient, developed in our own laboratory, produced from the only the best raw materials, continuously checked and guaranteed free from pollutants. 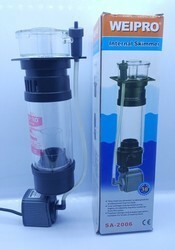 Branded aquarium filter available at wholesale rate in Jharkhand's biggest mall.